P.S. : Karin's cat is dead. And this occurred hot on the heels of her parents' demise. No wonder her grades at school are suffering. No wonder she finds herself railing at God. All that changed when she learned that she was a god herself. It's that ring she's wearing. Her mother gave it to her. Somehow, she can use it to channel powers and abilities Sailor Moon only wished she had. 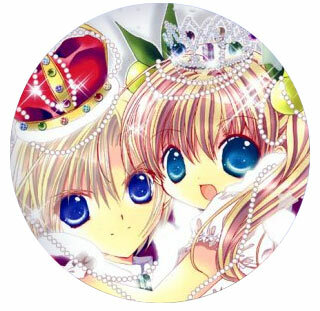 Brother and sister team Kazune and Himeka Kujyou are the only ones who can help her with her cosmic make-over. 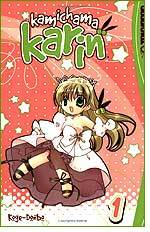 Kamichama Karin is the first Shoujo (Girl's) manga by Koge-Donbo (whose previous work includes PITA-TEN and DI-GI CHARAT). It's a wild take on what happens when a schoolgirl goes goddess. Let's get deified! 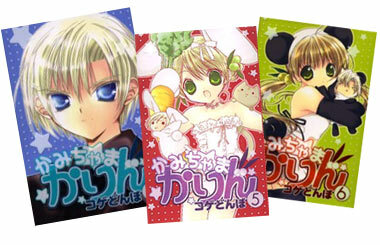 Below: Covers from the manga Kamichama Karin from Japan.